For Truc's birthday she & the rat pack flew to Sin City to commemorate the event. With the help of her brother, I kept her in the dark until the last minute, surprising her in the hotel. I opted to drive down due to the furry baggage I haul around & because I was looking forward to exploring Nevada latitudinally . From Reno it was seven hours one-way & the scenery was very engaging. With each turn I saw a new dessert-scape; snowy mountains the whole while on my right and the great basin to my left littered with sage, joshua trees, dust devils, and even a misplaced lake or two. As for the road, talk about straight and narrow, my personal bests: longest straight away= 15miles, longest drive with my knee= 5miles, & longest no touching the wheel= 1.1miles=) Once in the big "V" the company was great and everything we did was an experience. My favorite escapades included the CirduSole "O" show(eight rows back center), the free water cannon show infront of the Bellagio, and sweeping games of liars dice. Luckily I left Freemont St 80$ up on roullete and high in spirits. My drive back was strikingly similiar not counting the night spent in Death Valley. My friend Gretchen and I assembeled our thoughts enough for a late start at the summit of Mt Rose(10,776') the third highest mountain in the Tahoe basin. Although there are ample backcountry lines to be had in the area we decided to go boardless, opting for a lightweight summit assult. We had on our snowshoes and lucky for Rem, he was just light enough to tred on top of the crust 95% of the time. 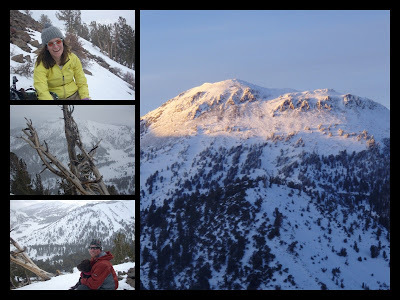 We had no defined route, and all trails were under 6ft of snow so we began asceding along a ridge near a backcountry bowl called the Hour Glass. Eventually we came to a crest and took our first step at the monolithic Mt Rose, looming like a mountain of Mordor in the distance. It was a sunny day, and toiling along felt warm. Our routless direct attack led to us straight linning up and down over ridges on our way to the base. After 2 1/2 hrs we arrived at the foot, ate lunch, and continued up the steep south face. I noticed immediatley the direct inverse relationship between our progress and the pitch of the slope. I also became acutley aware of my appreciation for the aggressive mountaineering crampon my snowshoes are outfitted with as we climbed 2,000 vertical feet onto a vast sheet of hard crust. Rem did awesome digging in his nails like grapling hooks as he ascended. As we neared within 500 vertical feet of summit, we reached the snowline and entered a loose rock scree feild. Snowshoes came off and we climbed in a horizontal line up and over microwave sized rocks. After about fifty feet we realized this was incredibly unsafe as Gretchen, Rem, and I were all setting off rock slides. We reluctantly decided to decend back to the snowline. We then traversed laterally across the whole face of the mountain to get to the West ridge where we could ascend by hardpack again. On the ridge we found parts of the summer trail blown clear of snow for a few yards only to lead directly into solid walls of snow. Another cool phenomenon were the ghost prints left behind by a previous hiker. Apparently someone had hiked the summit after a fresh storm compressing a snow track as they went with their boots. Later as the sierra was pounded with winds up to 200mph the snow surrounding the track blew away, forsaking the reverse prints to remain. We summited at five, and unfortunatley the cold had already killed the cameras. It's a unique vantage point, possibly the one spot where you can see Lake Tahoe over one shoulder and Reno over the other. Being up so high induces an errily isolated feeling despite my crystal view of downtown, 15 miles away. Our stay uptop was brief as I had begun realizing getting caught in the dark was inexcapable. We were well off the summit when the stars came out, alternating torchlight and dim moonlight for navigation. I had a general idea of our position, but in darkness that begins immediatley where your headlamp ends orientation becomes a challenge. My GPS battery was on its way out so to conserve I shut it off and spot checked our heading every few minutes. The constant up-down of the Sierras has a disorienting effect even in the daylight. At this point Remi was becoming lethargic and would make a snowy bed for himself at every resting point. I leashed Rem to keep him going and to help pull him up the north side of the ridges which stashed deeper snow. I had begun to feel as if I were navigating a MC Escher drawing when we saw a flash of tail lights in the distance. We continue to watch as the car wound up the pass and eventually illuminated my Hel-ement. The rest was a downhill cakewalk, arriving at the car eight hours after departure. We ended the day with fine Qdoba burritos and very deep sleep. Being slightly disoriented in the wintery woods at night is just the kind of fun I like.